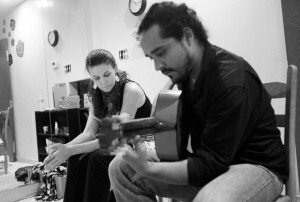 Flamencura Music and Dance Studio opened its doors in May, 2010 as Austin’s only dance studio dedicated to Flamenco. Flamencura has a lovely 750 square foot main studio, equipped with mirrors and sprung plywood floors specially designed for flamenco dancing. Most of our dance classes are taught by founder Olivia Chacon. She has danced flamenco for over twenty years, including more than four years of study in Spain with the world’s greatest flamenco stars. She is an experienced performer, having danced in theaters and flamenco tablaos throughout Texas, Spain, Mexico, Germany, and Cyprus. Olivia is also a seasoned instructor, and enjoys introducing new students of all ages to the joys of flamenco through her original choreographies. Other Flamencura instructor include Claire Spera (Intermediate Wednesdays) and Guillermo Tabares (Beginner Sundays and Intro Castanets). For those who have attended at least two sessions of Beginner Flamenco, and have mastered the most basic concepts of flamenco technique and rhythm. Students in Advanced Beginner will practice both 8 and 12-count rhythms and more complex marking, footwork and turns, and will learn short choreographies in a variety of styles. Students are encouraged to repeat Advanced Beginner until the instructor recommends they move on to the next level. 8-class session $98. Wednesdays 6:30-7:30pm, Sundays 1-2pm. For students who have completed at least six months of Advanced Beginner classes, and feel comfortable with all the material covered in that level. Dancers should be be able to dance fluidly with proper rhythm, posture and technique, and be prepared for the faster pace of a twice-per-week class. Students in this class work on increasing strength, speed and musicality in footwork, and expression through the upper body. Intermediate students will have multiple opportunities to perform complete choreographies throughout the year. Students should stay in this level, with good attendance twice per week, until the instructor determines that they may move on to the Advanced class, which could require several years. Monday and Wednesday, 7:30-8:30pm. Students at this level should already have a background of at least three years of flamenco dance instruction, and have solid knowledge of a wide range of flamenco technique. Classes will focus on improving musicality and speed of footwork, body coordination in more complex combinations, turns, and learning to identify and work with a range of musical palos (styles). In addition, Advanced dancers will study improvisation for Bulerias, listening and responding to live music, and will learn choreographies for performance opportunities throughout the year. Tuesdays and Thursdays 6:30-7:30pm. Please consult with instructor to determine the proper classes for you to attend!